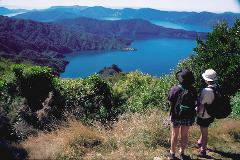 The Four Day Freedom Walk on the Queen Charlotte Track includes your water taxi to and from the track, accommodation while on the trail, overnight luggage transfers and Picton drop off/pickups. The Four Day Freedom Walk on the Queen Charlotte Track includes your water taxi to and from the track, upgrade accommodation while on the trail, overnight luggage transfers and Picton drop off/pickups. The Five Day Freedom Walk on the Queen Charlotte Track includes your water taxi to and from the track, standard accommodation while on the trail, overnight luggage transfers and Picton drop off/pickups and rest day at Portage Resort. The Five Day Freedom Walk on the Queen Charlotte Track includes your water taxi to and from the track, accommodation while on the trail, overnight luggage transfers and Picton drop off/pickups and rest day at Lochmara Lodge. The Five Day Freedom Walk on the Queen Charlotte Track includes your water taxi to and from the track, upgrade accommodation while on the trail, overnight luggage transfers and Picton drop off/pickups and rest day at Portage Resort. Like the idea of having everything arranged for you and staying in superb accommodation but still walking independently? Our Deluxe package combines the best lodge and luxury hotel-style accommodation available. The Queen Charlotte Track is fast becoming a world renowned walk with fantastic coastal vistas, fine ensuite accommodation, and gourmet a la carte dining in the resort restaurants.